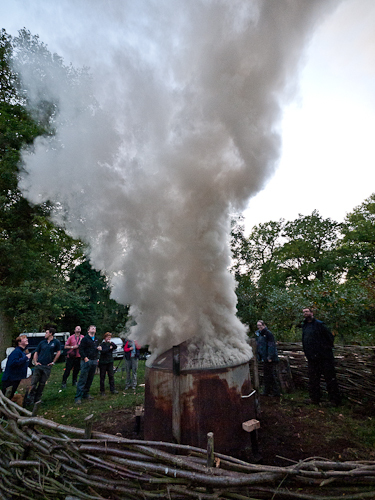 A very successful OneOak charcoal burn and training event was held recently at the University of Oxford Harcourt Arboretum. The event was managed by Alex and Lisa of Chew Valley Charcoal (read more about the preparations). 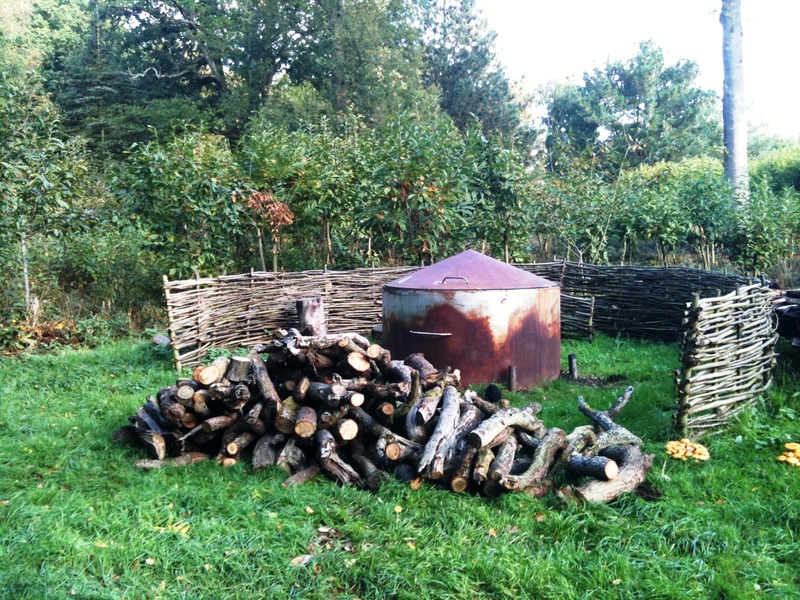 The charcoal kiln filled to the brim with OneOak branchwood. The lid lies behind. The charcoal kiln soon after lighting. The smoke is cold and very wet so sinks to the ground. Notice that the chimneys are still blocked and the lid propped open. 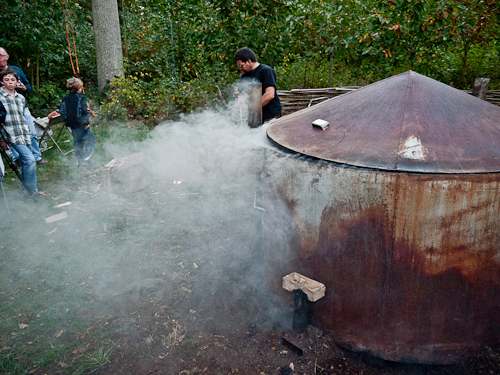 The charcoal kiln has heated up and the smoke starts to rise. It is quite dark in colour, indicating that it is still full of moisture. 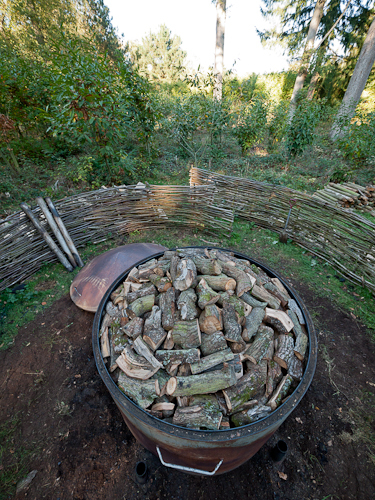 As with all good charcoal burns, a nearby fire is lit to provide warmth and for cooking. 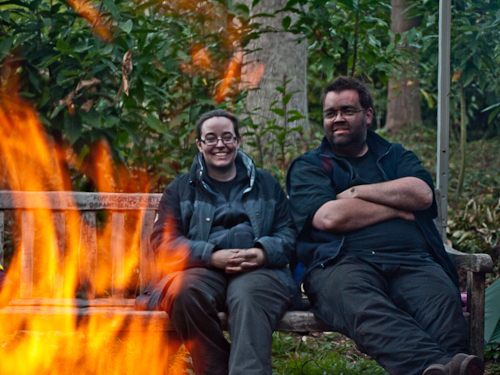 Two volunteers on the charcoal-making course enjoy a break. 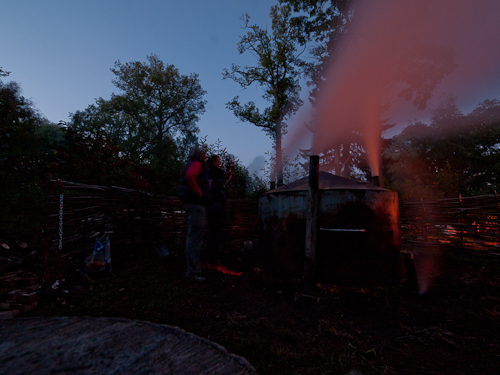 As the night sets in the draw of air changes in the charcoal kiln. Now hot smoke pours from the side chimneys. Branchwood from the OneOak tree was mixed with sycamore wood to fill the kiln; charcoal from the two different woods being separated later. 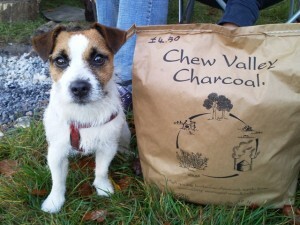 A total of 28 bags, each containing 4kg of OneOak charcoal, were produced after the 48 hour burn. More photos will be posted soon. About two cubic metres of branchwood from the OneOak tree has been delivered to Oxford University Harcourt Arboretum. It will soon be used to produce OneOak charcoal. The charcoal burn is being undertaken by Alex from Chew Valley Charcoal, who is also running the burn as a course to show how charcoal is made. There are places still available, for the weekend of 15/16 October: see more information and how to book. Even as the OneOak timber begins to be used in a building (read more) and is being kiln-dried ready for fine furniture and joinery, uses for other parts of the tree are still being found. Two tonnes of branchwood from the tree will be turned into charcoal. 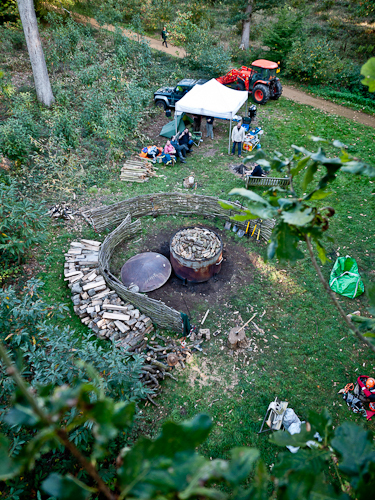 In an exciting move we have teamed up with the Botanic Garden and Harcourt Arboretum of the University of Oxford to hold the charcoal making as a weekend course for members of the public. Why not have a go? Participants are invited to stay through the night (please bring your own tent) to see the final stages of the burn early on the morning of the 16th October.